GDElla - the postcard of the "bride and groom" is a fake. German postcard publishers would add veils, etc., to pictures to make them look like wedding ones. It was unusual for the Prussians to release photos from weddings -- and I have postcards of "brides" for nearly all of the Kaiser's kids. 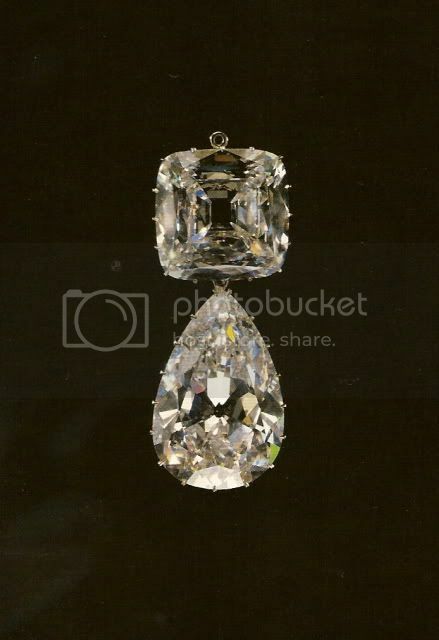 There was a well-known set of photos taken of Victoria Louise (perhaps for her coming of age or her engagement) where she wears a lovely diamond tiara which is similar in shape if not the design to the Meander tiara which belonged to Cecile. I'm not sure if it's this tiara or the her wedding tiara which her daughter Frederika wore at her wedding. I think it may be this one as Frederika would later inherit it. Well GDElla, let's see it anyway please. It will just be interesting to see a picture of them together; whether it is a fake or not, I don't really care....Do pots it for us if you have time. Martyn, GDElla did post the "wedding" of VL and EA - that's what I was commenting on. Well fake or not, it is actually quite a nice image. GDElla is always so very generous wioth her images and information and we all appreciate her generosity. Hugely. yes indeed, I greatly appreciate all the photos whether or not they have been slightly altered or not. Keep them coming Grandduchess! Why would George VI be on such good terms with Fredericka at the time of her wedding by loaning her a tiara? Did George attend? Oh, I know--I mean it obviously isn't an actual photograph. Still, it looks like the picked the actual tiara she wore so I put it in. (Hope I didn't cause any confusion--it looked pretty staged to me, ala those montages of family members). The dress didn't look at all like how I've seen VL's described. I didn't know that they didn't like to release photos though--interesting. I just figured I hadn't stumbled across any yet, just sketches. Wonder why--the Romanovs didn't do it either for a long time (and those dresses/jewels would've been something to see on some of those brides!). I guess we just have Vicky's wedding photograph and Irene's to go by. I don't know his relations with VL but weren't they still on pretty good terms with the Greeks? Marina and Philip had married in by then. Perhaps it had more to do with Paul. George VI did not attend the wedding. Frederika did seek permission to marry, as a British princess -although technically she wasn't. George VI also loaned the tiara (more like a small crown) to Ortrud when she married Ernst August. Elizabeth II allowed Pss Alexandra of Hannover to borrow the tiara when she married Andreas of Leiningen. Strangely enough, the crown was not worn by Chantal when she married Ernst August in 1981. Maybe the marriage would've ended up better if she had. Didn't George, Duke of Kent attend the wedding--especially fitting seeing as how Marina was the groom's cousin? That's a shame VL had no wedding photos. How nice you were able to talk to her--I find her fascinating (I love her autobiography and her romance/marriage). I have the Illustrated London News' issue of the wedding with some decent sketches but I'm never entirely happy with the 'action' ones (the dance, etc) as it's hard to really get an idea of the faces, dresses, etc.. There are some photos of Helen Vladimirovna and Prince Nicholas of Greece's wedding floating around here somewhere. Also one of Mavra (alone, not with KR). I would LOVE to have seen Ella but I think I have to make do with the sketch and since the brides wore the same regalia, use some imagination. In a New York Times article, April 1921, on the death and funeral of Kaiserin Augusta, it states "For though the Emperor insisted upon the utmost simplicity on her part in his home, yet for her court appearances he desired her to outshine all other women. To this end, he helped to provide her with nearly $2,000,000. worth of jewels, a collection second only to that of the Czarina." If this is true, it will be very interesting to research her collection as it compares to that of the Romanovs and Windsors. William actually designed some of her pieces himself. There used to be a thread on this but it seems to have disappeared. Wilhelm did design several pieces for Dona--unfortunately, they weren't very attractive, at least in my opinion. emerald & diamond tiara from the first quarter of the 19th century. It is designed as a graduated bandeau of triple laurel leaves, highlighted with 13 larger millegrain-set round daimonds simulating buds, interspaced with five pairs of diamond-capped pear-shaped cabochon emeralds, one irreglarly vaceted, mounted in silver and gold. It is probably of Russian origing, dating from the first quarter of the 19th century an arrived through descent in the House of Prussia rowerds the end of the century. Dona received this tiara from Wilhelm at the time of their anniversary in 1906 and it was eventually inherited by Victoria Louise. It was sold in 1974. Dona also had many gorgeous sets of pearls which she often wore in long, looped strands.